In a conventionally partisan floor speech that lacked any indication of the doubt one might have expected given her long refusal to take a public position, Maine senator Susan Collins announced her support for Brett Kavanaugh’s confirmation as a Supreme Court Justice. Barring something really strange, this should clinch a victory for the beer-loving conservative jurist despite allegations of sexual assault and some serious discrepancies involving his own testimony. Earlier today, another possible waverer, Jeff Flake, indicated he would vote for Kavanaugh. In the unlikely event that another late decider, Joe Manchin, decides to flip after voting to cut off debate on the confirmation, Democrats would still be short a vote. Once the Senate has worked out Steven Daines’s travel itinerary (he will be home in Montana Saturday morning to attend his daughter’s wedding), the final vote will be held as quickly as possible — perhaps as early as 5:00 p.m. EDT on Saturday. Collins’s speech tracked every Republican talking point in defense against charges that the highly ideological vetting process that led to his nomination would produce a highly ideological Justice. As she has done before, she suggested at great length that Kavanaugh’s respect for precedent — or to use his misleading term, ”settled law” — would keep him from tampering with reproductive rights. She cited, moreover, the pro-choice positions of past Supreme Court nominees of anti-abortion Republican presidents as evidence that Kavanaugh might similarly outrage all the people — including the 49 of her Republican Senate colleagues — who hope he will help eviscerate a right to abortion that they do not themselves support. In an expression of either naïveté or cynicism, Collins did not acknowledge that the entire Federalist Society–run vetting process Trump used to select his SCOTUS nominee was designed precisely to prevent the possibility of any more “stealth” moderate Justices like the ones she lionizes. 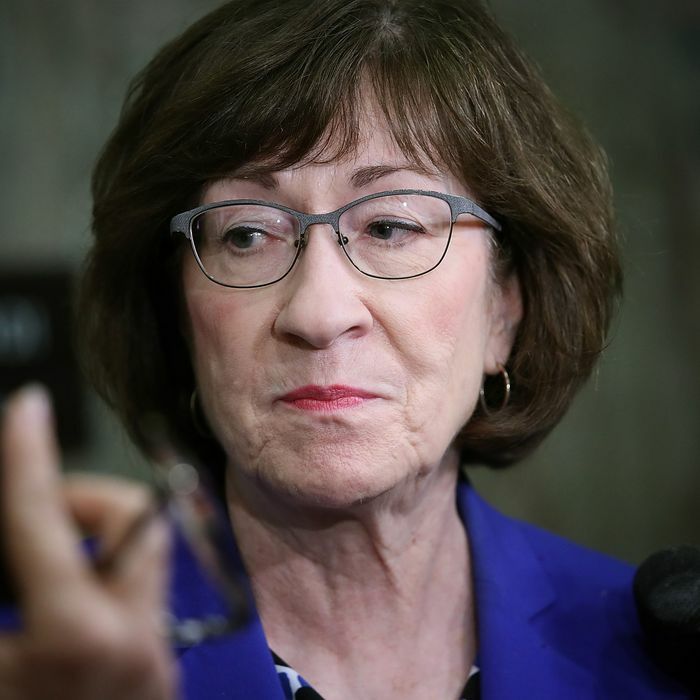 Near the end of her remarks, Collins followed other Republicans in purporting to believe that Christine Blasey Ford was the victim of sexual assault — but then accusing her of lying under oath by confidently asserting that Kavanaugh was her assailant. Applying a “presumption of innocence” standard that really has no foundation in judicial confirmations, Collins acquitted Kavanaugh of wrongdoing thanks to the absence of corroborating evidence, which the hasty FBI investigation earlier this week predictably did not find. And in another partisan maneuver, she treated Ford as a victim of an anti-Kavanaugh leaker — whom she then presumed to denounce with a passion she did not show in the rest of her speech. In what sounded very much like a flank-covering compensatory effort, Collins concluded her speech with plenty of shout-outs to the #MeToo movement and to victims of sexual assault, and lots of pious centrist tut-tutting about polarization. But what it really confirmed was that Collins made up her mind to put on the party harness some time ago. All of her well-documented equivocation about Kavanaugh, which continued to the very end, was a waste of everyone’s time.